A variety of methods have been developed to measure cell prolife-ration in whole population of cells. These include the detection of antigens by immunohistochemistry, measurement of DNA synthesis, and quantification of the reducing environment of the cells. The latter relates to the fact that when cells are metabolising they maintain a reducing environment within their cytosol and this reduced state can be measured spectrophotometrically through the conversion of fluorometric/colorimetic REDOX indicators. This application note focuses on quantification of the reduction of the intracellular environment by alamarBlue®. The reducing environment of the cells in the alamarBlue® assay is measured through the conversion of resazurin (oxidised form) to resorufin (reduced form)¹ (Figure 1). This results in colorimetric (absorbance) and fluorescence changes. Resazurin is blue and non-fluorescent whereas resorufin is red and highly fluorescent. It is a sensitive assay if working with higher than 5x103 cells per 100 µL, relatively non-toxic and provided that it is carried out carefully, the same replicates can be followed over several time points. The disadvantage of this assay is that it is not a direct cell counting technique like heamocytometry, because the fluorescence or absorbance signal can be affected by both changes in cell number and cell metabolism. Early passage Human Osteoblast cells (HOb 406-05a), supplied by the European Collection of Cell Cultures ECACC² were seeded onto substrates A and B at a density of 104 per sample. The samples were each placed in a well of a 24-well plate, covered with 1 ml of culture medium and incubated for a total of 17 days. The culture medium was McCoy’s 5A medium containing 10% heat inactivated serum, 1% glutamine and vitamin C (30 µg/mL). To measure cell proliferation, the seeded substrates were incubated for 4 hours (longer incubation times may be used for greater sensitivity) with fresh culture medium supplemented with 10 vol% alamarBlue®. A total of 10 replicates were used for each substrate. Following incubation, 100 µL medium from each well was transferred to a 96-well black polystyrene microplates and replicated 3 times. 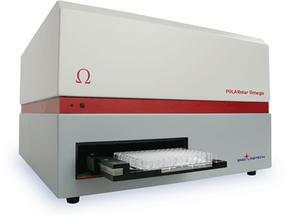 Fluorescence (excitation 530 nm, emission 590 nm) was measured on a FLUOstar OPTIMA microplate reader. (Note: Colorimetric detection can be monitored by absorbance measurements at 570 nm, while using 600 nm as a reference wavelength. However, it tends to be less sensitive because there is considerable overlap of the oxidized and reduced forms of the alamarBlue® when measured by absorbance³). The alamarBlue® reduction by the cells expressed as fluorescence emission intensity units was measured on days 1, 3, 6, 8, 10, 13, 15 and 17 of the culture period for different samples. The % reduction of alamarBlue® for each case was calculated using the formula where SX is the alamarBlue® fluorescence signal of the sample at day x, S100%reduced is the signal of the 100% reduced form of alamarBlue® and Scontrol is the signal from the control: the culture medium supplemented with 10 vol.% alamarBlue®. The 100% reduced form of alamarBlue® was produced by autoclaving controls (ie. culture medium supplemented with 10 vol.% alamarBlue®) at 121°C for 15 minutes. Fig. 3: Percentage reduction of alamarBlue® as a function of culture time, for substrates A and B. Fig. 3 shows the percentage reduction of alamarBlue® after being averaged and including the standard deviations. Greater alamarBlue® reduction (i.e. higher levels of cell growth) is observed for substrate A over the whole culture period. 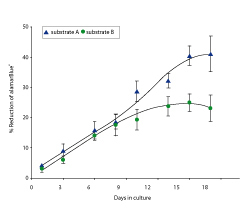 In both substrates, cell proliferation increased with culture time over the first 15 days. The metabolic activity of the cells growing on both substrates seems to slow-down by day 15, suggesting that the surfaces were advancing into confluence. This application note shows that the reducing environment of cells can be accurately monitored using the FLUOstar OPTIMA. The attraction of the alamarBlue® assay is that it incorporates a non-toxic reagent which allows continuous monitoring of cell proliferation on the same samples using either fluorescence or absorbance. BMG LABTECH’s FLUOstar OPTIMA is a flexible multifunctional microplate reader that has four different measurement modes in one instrument: fluorescence intensity, time-resolved fluorescence, luminescence and absorbance. With two optional onboard injectors and a standard 45°C incubation chamber, the FLUOstar OPTIMA can easily become fully automated to perform any cell-based assays. alamarBlue® Technical Datasheet. 2002, AbD Serotec Ltd.
alamarBlue® is a registered trademark of Morphosys UK Ltd.